Is la pompe not cool any more? Is it not cool to swimg like Django anymore?! I get the feeling that swinging like Django will always be cool. It could be that some don't use the pompe comping style because they find it difficult to pull off convincingly. In my case, I've been playing straight ahead jazz for years, so my default comping style is miles apart from what is expected in the gypsy jazz genre. As a result, I have a really difficult (if not impossible) time getting it to sound genuine. While I'm fairly confident that the solution to my pompe woes is offered in this website in the form of Mr. Horowitz's book, I haven't gotten around to picking it up and working through it. Give several French chefs the same recipe for beef bourguignon and they'll all taste a little different. La pompe is not cool at all! If it is, Django would have named his band "Quintette du COOL Club de France." Instead, he named it "Quintette du HOT Club de France." I think that in the old days only the lead players -- and only one soloing guitar -- would have a mic, so the sound would be like in the old recordings, where Django sat up close to the recording mic. But now, with two or three guitarists trading solos back and forth, and either no amplification, or amplification for all, the rhythm player has to play more staccato-like and dry, so that the 6-string burst of sound quickly gets out of the way of the 1-string solo line. Also, the older "2/4" feel sometimes gives way to a more modern "4/4" feel (four equal beats) -- e.g., Adrien's take on Impressions -- which sounds different from la pompe. 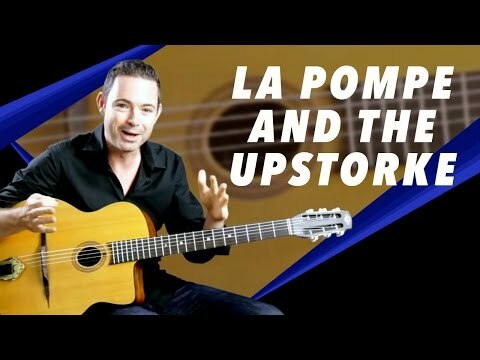 I saw this video recently discussing La Pompe styles that vary by region, generation or just personal taste. I gotta disagree about Django not being cool for 70 years... A quick search on Instagram for #djangoreinhardt will show u hundreds of hipsters, punks, gutter punks, hippies, tattoo fanatics, etc who are all posting photos of their Django vinyl collection. Gypsy jazz is très en vogue right now for better or worse. The coolest of the cool listen to or play Gypsy Jazz. It's "too cool for school" if you know what I mean. If fact, it's so cool that most people have never even heard of it. That's when you know it's cool. Plus, the guy who invented it was a guy named Django. The "D" is silent. How cool is that!